Are Handbrake Turns A Thing Of The Past? Boy Racers doing donuts on the local supermarket car park are about to become extinct as car technology phases out traditional stick handbrakes. A survey from CarGurus has found that just 37% of new cars come with a traditional handbrake, with electronic parking brakes the new fashion. As electronic handbrakes can not be operated whilst the car is in motion, the days of pulling Dukes of Hazard style skids across dusty land are going up in smoke. Speaking about the research, Chris Knapman, editor at CarGurus UK, said: “It's official, the death of the handbrake is coming as manufacturers switch to electronic parking brakes in huge numbers. “Within the next few years we expect the number of cars on sale with traditional handbrakes to decline further, likely only to be found on a select number of niche models. “Of course, the benefits can't be ignored, but as the latest technology trickles through manufacturer line-ups, many new drivers might never experience one of the most familiar of automotive features. Just two car brands, Dacia and Suzuki, have manual handbrakes fitted across their entire range, whilst at the top end of the scale Audi, Jaguar, Land Rover, Lexus, Mercedes and Porsche have no models with traditional handbrakes. With the technology becoming more and more affordable it's likely that the manual method will be phased out entirely over the next few years. Electronic handbrakes operate via a switch and can disengage automatically when a car pulls away. 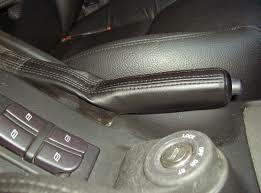 The systems are easier to apply for drivers as they require less physical effort from the traditional handbrake.